The timeline of 3D printing is progressing in a very logical manner. When the first 3D printers became available they were quite expensive and not market proven. It became clear that rapid prototyping is highly efficient and it wasn’t long before engineering firms picked up 3D scanners to work with the printers, but they were also expensive. RepRaps hit the market going on a decade ago, and now there’s a selection of affordable, consumer-grade 3D printers. So it follows that affordable, easy to use 3D scanners would soon come trickling in. And that’s exactly what’s happening. There are five 3D scanners in the $200-$2000 range either in development or already available. These aren’t engineering-grade scanners that can accurately reproduce mechanical systems, but they’re still powerful enough for many fun and practical solutions. There are two main types of 3D scanners: turntable desktop units for small objects and handheld units for large objects and scenes. The turntables are easier to use and are great for replacing chess pieces and duplicating figurines. Handheld units require a bit more user involvement but are far more versatile, allowing for the scanning of faces, full bodies, large rooms, as well as small objects. The Sense from 3D Systems falls into the latter category. 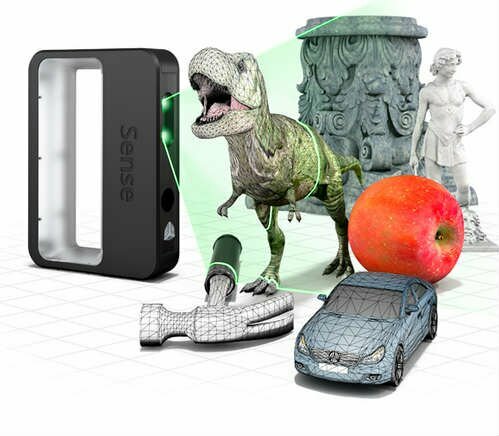 For $399, the Sense looks to be the easiest to use 3D scanner. That makes sense as it’s being produced by the largest 3D printing company. It’s specifically made for working with 3D printing, and the scan models can be edited in Cubify software. There are different modes for different types/sizes of scans, so it knows to look for a small object or a whole person depending on mode selection. And the software automatically seals and solidifies objects so they’re easily sliced for printing. Objects can be exported as STL or PLY to preserve color, so scans can also be uploaded to Cubify to be printed in full color. A handheld scanner for $399 will certainly help even more latent makers transition into democratized manufacturing, but 3D Systems is sweetening the deal by offering bundle packages. My favorite is the Cube Sense pack, which includes a Cube, a Neon Green PLA plastic cartridge, your choice of 3 additional cartridges, the Sense 3D scanner, and your choice of Cubify Design or Sculpt 3D software for $1749. That’s nearly $300 in savings and provides a great foundation for getting into digital manufacturing.